Everything is bigger in Texas. Here’s where to go in Dallas to live it up, Texas style. Eating out. Like it. Going to the movies. Like it. Bring them together. Love it! 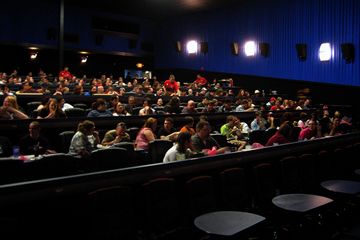 Order food and have it delivered to you while you watch the latest films at Studio Movie Grill in Dallas. It isn’t just the selection of food and drinks (alcohol included) that makes the experience special. It’s the fact that you have leg room and a large comfortable rolling chair where you won’t have to fight over the armrest with your neighbor. The check comes about 45 minutes before the end of the show. That minor distraction is definitely worth munching on nachos or a hamburger or a healthy salad during your flick. Make sure to reserve a seat online as the shows sell out quickly. There is one in Vegas now, but Pete’s started in Texas. 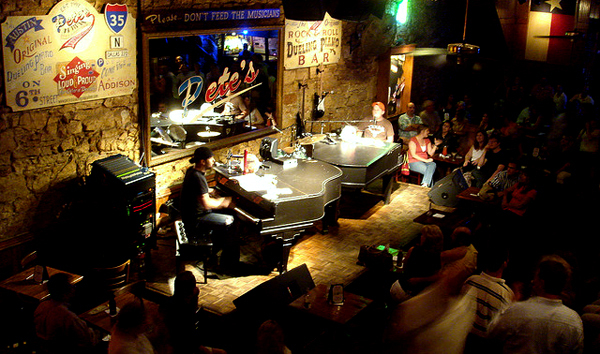 Pete’s Dueling Piano Bar opened in Dallas in 2001 (more specifically in Addison, a suburb). Two baby grand pianos and four piano players battle each night with music from Abba to AC/DC to Blink-182 to Frank Sinatra. It gets crowded and it gets wild. And if your throat isn’t sore the next day from singing along, then you’ll have to go again to fully experience the genius that is Pete’s. Open from 7PM-2AM, Wednesday to Saturday. Showtime is 8pm. It’s a gas station, yes, but don’t let that throw you. 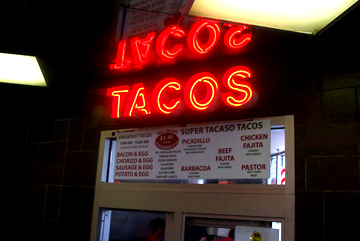 It is also the place for the best Mexican tacos in Dallas. A local secret, the spot attracts business people in suits along with construction workers and college students. Breakfast tacos are available from 5-10AM and it’s open until midnight. The tacos are made fresh and they are hot, spicy and delicious. They’re small, so you can easily eat at least two for a meal. And they’re only $1.40, so you might as well stock up. All tacos are made with diced onions, cilantro, jalapeno, sliced lime and hot sauce. Choose from beef, chicken or pork and corn and flour tortillas. Outside, in good weather, you can buy hot, fresh corn in a cup (elote). Well, not just corn. The women running the cart will ask if you want everything, just say yes. This will be a layer of corn topped with a layer of butter, cheese, mayo and hot sauce, and then repeated. All in a Styrofoam cup with the spoon stuck through the lid. Mix well before you take a bite. I didn’t and ended up with a mouth full of hot sauce. Crack open a bottle of your favorite wine or any other drink you fancy while you paint your own masterpiece. A professional artist leads a two or three hour class where one painting is used as a guide, and those in the class paint their own version of the piece. At the end of the night, you take home your canvas. If you don’t want to hang it in your own house, give it to a relative. The canvases are 16 x 20″, and keep in mind that there are plenty of shipping services around Dallas if you want to ship your piece home as you continue on your travels. Oh, and this is a great place to meet people. It’s easy to bond over your canvas. And what your painting looks like doesn’t really matter. Two hour classes cost $35 and three hour classes are $45. Call for reservations. Enjoy food and drinks out on the patio or inside, where the walls are lined with vintage arcade games, just waiting there, quietly challenging you to try for the high score. 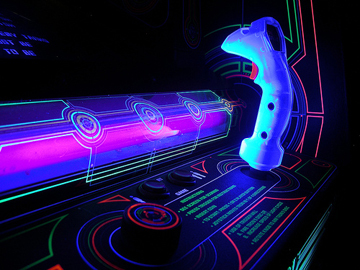 Games include Tron, Donkey Kong Junior, Street Fighter, Star Wars, Space Invaders, and, my favorite, Ms. Pac-Man. You can also play giant Jenga, admire the vintage style art throughout the venue, or just people watch. Monday is half price food and all night happy hour. Tuesday is $3 Texas drafts and Wednesday is pint night, with most pints priced at $3. Tuesday to Saturday, enjoy happy hour until 8PM. Dallas makes the list on the 20 Best Beer Towns in America, and if you’re there and looking for a job writing, why not pitch to Southwest Airlines’ inflight magazine, Spirit, headquartered in Dallas, TX.